Victoria was a lot more enjoyable on my second trip there as an adult. While vacationing in Vancouver in late April / early May in 2017, we decided to take a day trip to the BC capital. 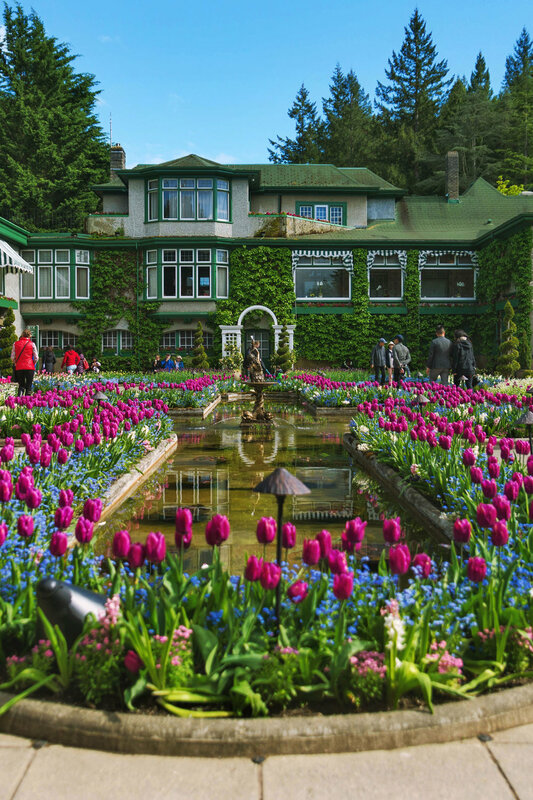 The main attraction for most visiting Victoria is probably Buchart Gardens. A vast and beautiful landscape of various flowers, trees and lakes, it has several gardens to stroll through such as The Sunken Garden, Rose Garden and Japanese Garden amongst others. I definitely appreciated it a lot more on my "adult trip" than when I had visited as a high school student. Without a car, we caught the SkyTrain from our Yaletown-Roundhouse station to Bridgeport station where we transferred to a bus (route 620) that took us to the Tsawwassen terminal. From there, we took one of the hourly ferries [schedule] to the island. It's about a 1 hour and 35 minute scenic ride through the beautiful San Juan islands between the mainland and Vancouver Island. Once arriving at Buchart Gardens, we had our scheduled afternoon tea at The Dining Room (make reservations). How adult, right? The food was ok, perhaps a little sweet overall for my taste, but the tea was good and the room itself provided a nice ambiance. Being that it's in the middle of a flower garden, it probably would’ve been a better experience if they had more open-air space. We may have been a bit too early in the year for that, though. We weren't able to see all of the gardens as the last bus to downtown Victoria leaves in the afternoon and The Sunken Garden alone is 151 flower beds spread over 5 acres. The bus from Buchart Gardens took us straight into the downtown area. Downtown Victoria is easy to walk, and a gorgeous one at that. Its British colonial history is seen in the Victorian buildings that line the wharf, and had we not been full from afternoon tea, we probably would've grabbed some food and sat out somewhere along the waterfront. While my memory from my first trip to Victoria in high school is hazy, I remember walking the area with my family and grandparents, admiring the surrounding architecture and outdoor performances that were happening around the wharf that time. It's one of the more memorable sights in Vancouver and Victoria. Downtown Victoria does close early, real early. 6PM seemed to be the closing time for most shops in the area. We caught a bus back to the Swartz Bay terminal and boarded the ferry back to Tsawwassen Bay on the mainland as the sun set. Victoria is a nice day trip, but it will take a full day. We spent around 15 hours total including transportation, leaving early in the morning and returning at night, but it was well worth it. From a visual standpoint, Victoria contrasts Vancouver quite a bit. While Vancouver is nice in its own right, Victoria is one of the most beautiful sights to see while visiting the area.